The quest for highly efficient and accurate diagnosis and specific therapy approaches has become the key factor for successful cancer treatment. Over recent decades, with the advancements in the fields of nanotechnology and biomaterials, functional nanomaterials have been developed as nanocarriers for cancer diagnosis and therapy. Unlike the traditional low-molecular-weight imaging probes and therapeutic agents, early clinical results showed that nanocarriers with imaging and therapeutic agents could result in increased accumulation in tumor, increased signal intensity, enhanced anticancer efficacy, and reduced side effects owing to the passive targeting features of nanoparticles via enhanced permeability and retention (EPR) effect. Recently, new nanomedicine enables the incorporation of imaging agents and anticancer agents in one system, namely, theranostic nanomedicine, which combines both therapeutic and diagnostic capabilities in a single entity for personalized medicine. Those novel nanosystems for cancer theranostics are emergent and have promising applications in concurrent molecular imaging of biomarkers, delivery of anticancer drugs, monitoring of nanosystems’ behaviors in vivo, simultaneous monitoring of the disease progression, and guidance of therapeutic outcomes. Biodegradable polymer-based theranostic nanosystems have demonstrated great potential clinical impact for the foreseeable future, due to their good biocompatibility and flexible chemistry. Dendritic polymers are a class of well-defined macromolecules with branching units, precise structures, low polydispersity, controllable nanoscale size, as well as highly adaptable and flexible surface chemistry. These unique features have proposed dendritic polymers as nanoscale imaging agents, drug delivery systems, and theranostic nanosystems for cancer treatment. 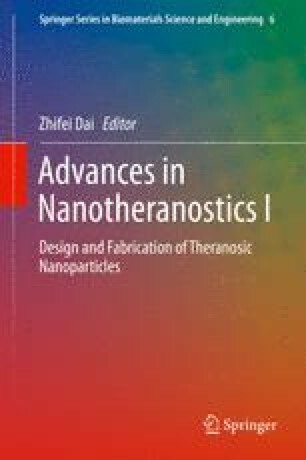 This chapter highlights the advantages of dendritic polymer-based theranostic nanosystems and the emergent concept of theranostics for the safe and effective tumor treatment in the next generation nanomedicine. The novel developments of dendritic polymer-based theranostic nanosystems described here provide great potential to achieve better cancer therapeutic.